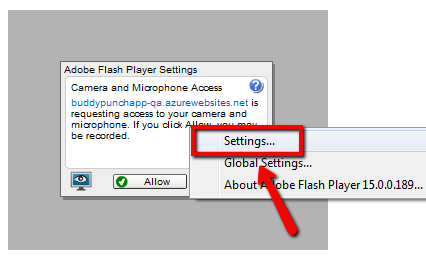 You can turn the webcam on/off for specific users. 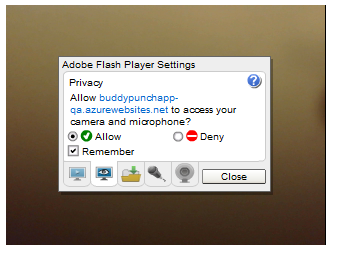 When using the webcam it should if you grand Buddy Punch access. Here are some tips. The HTML 5 video option is done in 2 steps. The Flash fall back option is 4 steps. * iPads and iPhones do NOT offer a browser with the capabilities for webcam photos. The Apple version of Google Chrome for iPads and iPhones is stripped of the video feature. 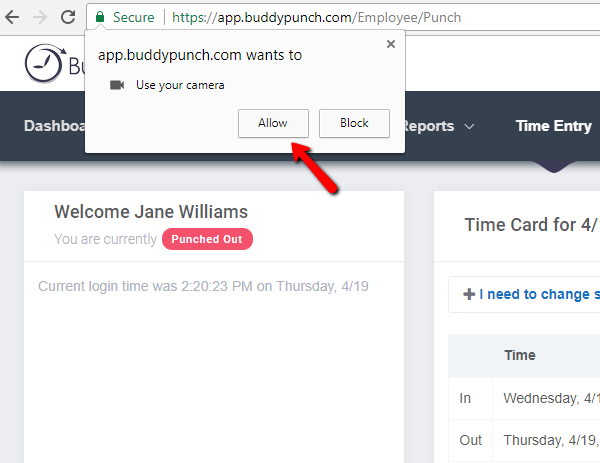 Buddy Punch is requesting access to your camera by that pop-up message that should be in the top of your browser. Some versions of Chrome or Firefox can look a little different, but they all have a top notification asking you for permission. That's it! 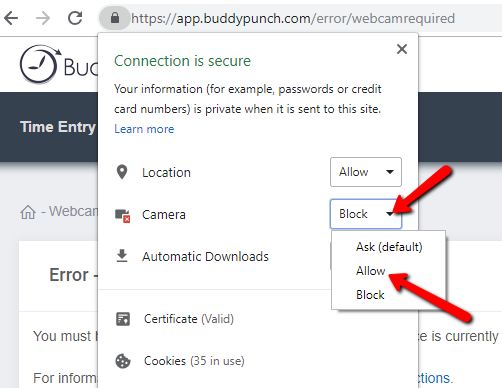 Your camera is now setup and will work every time; as long as you are not clearing your settings within Chrome or Firefox (such as clearing cookies). If you do, when you re-enter you will just have to again click the allow button. Note: If you accidentally click deny the first time do not worry; log out and log back in and you will again get the prompt to accept. Adobe Flash can be used as a backup option if your browser does not support HTML5. This is only for use in older browser or older devices. 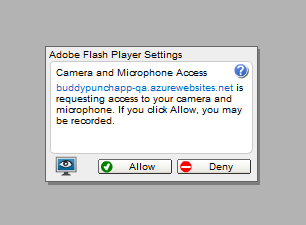 If you enabled the webcam in the steps above, you will not need to setup Flash. Follow these steps on any device you are using the QR Code feature and would like to enable pictures to be taken. Note that these steps will have to be completed for each browser you plan to use the feature with. If you are just using one browser then you just have to do this once. 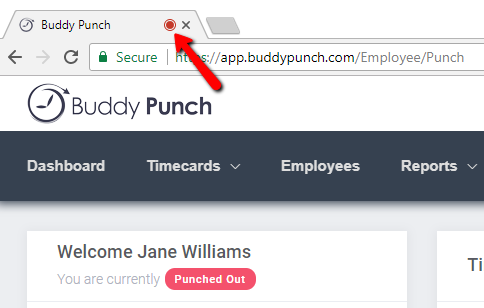 Step 1: Navigate to app.buddypunch.com and sign in using an employee account. You can set up a demo or dummy account to access this - the setting is global and will apply to all employees. Step 3: If you just click "Allow" on this screen the setting will not be saved. Instead right click anywhere on this box and select "Settings." Step 4: From here click on "Allow" and then "Remember." Then click Close. That's it! Now your employees will have their photo taken while using this browser on this device. Note that this setting creates a "Flash Cookie." If you clear your cookies or cache on this device you will have to repeat these settings. If you switch Windows Accounts on your device you may have to complete these steps for each account, as Flash Cookies are not shared between accounts in Microsoft Windows.